Passive House is a term that can throw you off, especially if you don’t know the origin of the term but remember passive solar. The terms are related, but they are not really the same thing. Passive Houses consider the importance of solar exposure and solar gain in seeking to balance energy losses and gains for comfort and economy, but Passive Houses are not limited to passive solar and are not, strictly speaking, passive solar houses. Passive House is an approach to building design and construction that results in a comfortable house without a conventional heating system: no need for an oil-fired or gas-fired boiler or furnace; no need for perimeter baseboard heat. 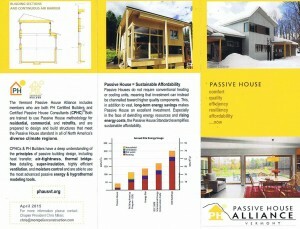 The term Passive House is a direct translation from the German PassivHaus. The initiative to create buildings that do not need a conventional heating system began in the U.S. in response to the 1973 oil embargo. The idea was adopted and advanced more quickly in Germany as PassivHaus and has subsequently expanded throughout Europe, where thousands of single-family and multi-family buildings have now been designed, built, and occupied. Advancement in the U.S. market has grown more recently, since 2000, and has begun to spread rapidly since about 2010. 1. Continuous Thermal Insulation: A well-insulated building envelope keeps warmth in during the cold months and heat out during warmer months. 2. Very Efficient Windows: Strategically positioned, highly insulated windows do their part to make optimal use of the sun’s energy. 3. Ventilation with Heat Recovery: Passive House ventilation systems provide plentiful fresh, pollen and dust-free air with maximum energy efficiency through heat recovery. 4. Air Tightness: Passive Houses are designed to avoid leakages in the building envelope, thus boosting energy efficiency while preventing drafts and moisture damage. 5. Thermal Bridge-Free Design: Avoidance of thermal bridges, weak points in the building envelope, contributes to pleasant, even temperatures while eliminating moisture damage and improving energy efficiency. Passive House standards include design calculations and performance measurement of building envelope insulation, windows, ventilation and heat recovery, air tightness, and thermal bridge-free design. U.S. Passive House standards are climate zone specific to account for climate-related differences in heating and cooling demand. Third party verification is part of the design and construction process. What makes Passive House a big deal? Passive Houses use up to 90% less energy than a typical U.S. building. That’s a big deal, when you consider historical increases and trends in the cost of heating in the last 40 years. It’s also a big deal, when you consider the need to replace fossil fuel energy sources with renewable energy sources (solar, wind, bio-fuels). Why not just go to Net Zero instead? Net Zero buildings generate as much energy as they use. Typically, the energy generated by a Net Zero building comes from solar photovoltaic (PV) panels, and the generated electricity is used for lights, appliances, and electric space heat and domestic hot water. Efficient heat pumps are a popular source of electric space heating and cooling today. Functioning much like the coils and compressor of a refrigerator, air-to-air heat pumps transfer heat from one side of a thermal barrier (like an insulated wall) to the other side; heat energy is extracted from outside air and transferred to the inside air during the cold winter, and it is extracted from inside air and transferred to warm outside air during the summer. The efficiency of a heat pump is greater than the efficiency of electric resistance (or “baseboard”) heat, because, for a heat pump, the electrical energy is used only to move or transfer heat that is already present, while an electric resistance heater generates heat from electricity, which is a relatively wasteful process (heat is a primary waste by-product of electrical processes used in machinery and appliances). So, a heat pump is typically more energy efficient than an electric resistance heater. The Passive House approach to design and construction minimizes the need for building energy (up to 90% less than a standard building, as noted above), so the cost of added renewable energy is minimized. If you are thinking of sustainability on an individual, family, or global scale, it is better to use less energy, so the Passive House approach makes a lot of sense in a Net Zero context. 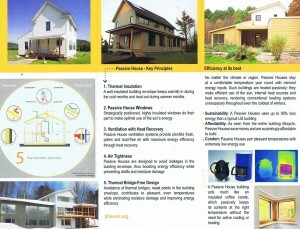 The websites of the Passive House Institute U.S. (www.phius.org) and Passive House Alliance U.S. (www.phaus.org) provide more information about Passive House. 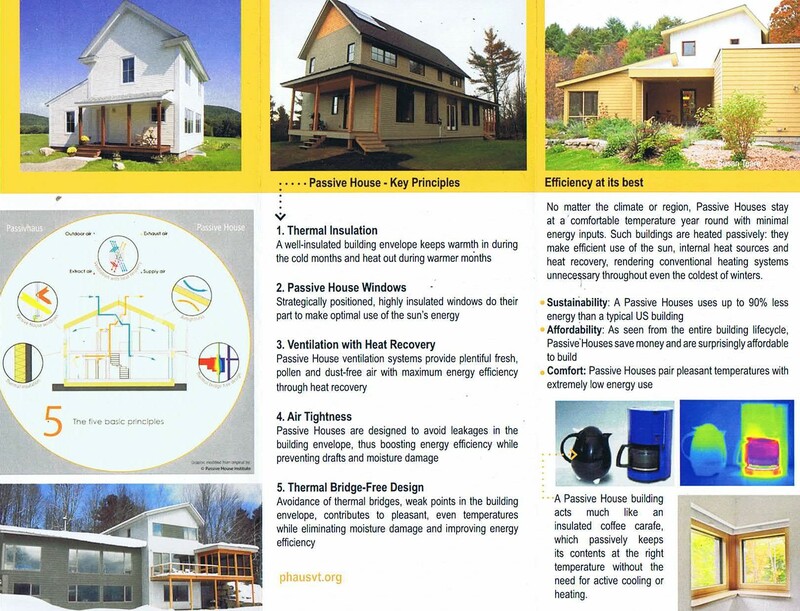 The images with this post are from a 2015 tri-fold handout developed by the Vermont Chapter of the Passive House Alliance (www.phausvt.org).